The Genoa (Genova) port is still Italy's busiest commercial port. It has a natural harbour which was the basis of Genoa's wealth and power in the 11th to 12th centuries. Today it is an industrial slab of containers and 1960s-style office buildings. It does, however, contain Europe's largest aquarium on Ponte Spinola. The old city center contains many architectural gems beginning with Porta Soprana, an old eastern gateway to the city. Christopher Columbus' house and the 13th century Church of San Lorenzo with its black and white striped exterior are both worth a look too. Staying in a monastery or convent guest house in Genoa is a unique alternative to mainstream hotel accommodation. Open to all, these guest houses give you a true insight in to life in Genoa - a chance to escape the hustle and bustle of Genoa and experience a hospitality tradition that has been around for 1500+ years. 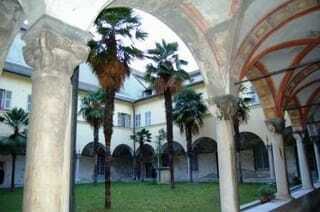 Review the monastery and convent accommodation for Genoa, choose your rooms and book today! Experience Genoa B&B Accommodation, book quality monastery & convent B&B accommodation in Genoa. Search & book rooms at genuine convents in Genoa with photos, reviews maps & room prices.